Good to know: How many neurons will your brain disperse while you read this? Rhea French’s devotion to her research comes not just from a curiosity about things unknown but also a belief that science is a powerful creative tool to throw into the mix. French’s enthusiasm and determined search for knowledge are qualities her supervisor, Professor Robert Flint, believes make her an exceptional researcher. For almost three years, he has called on her to assist in his own research examining the neuroscience of behavior and cognition, work that has continued over the summer, thanks to undergraduate research grants from the College. He has also come to count on her strong leadership. “I can depend on her to oversee the work other students are doing in the lab,” said Flint, who chairs the psychology department. Now, French’s contributions have been recognized beyond Saint Rose. 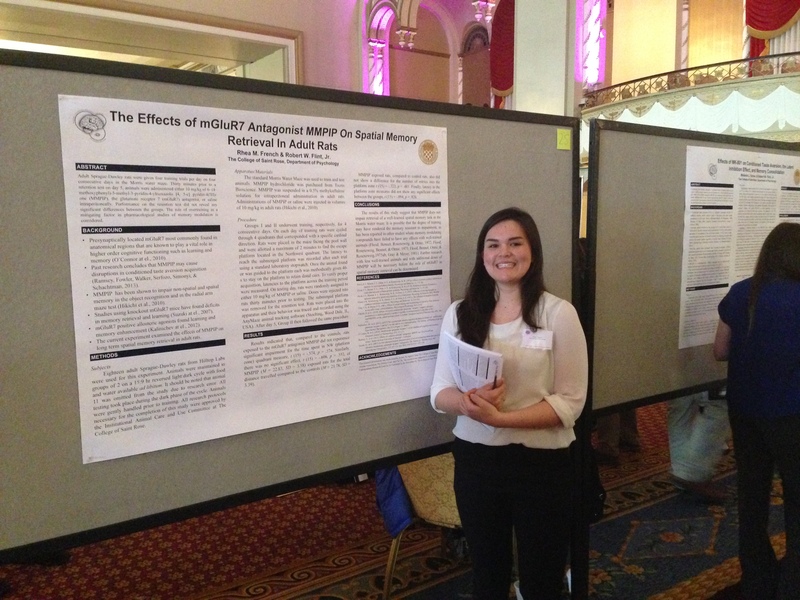 The Council on Undergraduate Research has named her the 2015 student winner in its psychology division for the Eastern region. The honor is highly prestigious and, Flint notes, represents the second time in three years a Saint Rose student has won. French’s winning work looks at the effects of tryptophan, an amino acid found in milk, red meat and chocolate, and how it affects serotonin, a neurotransmitter that contributes to the feeling of well-being. Her findings indicate that disrupting tryptophan may alter memory. She conducted the work, supported by a donation from the Sandusky family, as part of her William J. Hagan Research Honors Concentration. Meeting the requirements involved an intensive year-long independent project concluding with an oral defense before psychology faculty. After graduation, French, who hails from Morris, New York, would like to become an officer in the Navy. During her service, she hopes to pursue a Ph.D. in neuroscience and work as an experimental psychologist. Her aim: to continue to study the interface between brain and behavior, something she thinks about all the time. “It’s so interesting to think that a hundreds of neurons dispersed though your brain fire just so you can read this sentence,” she noted. ← International Dinner Night- Saint Rose goes global! Fantastic show of determination and a great work ethic!